Status: exelente without flaws - both track original and copy. 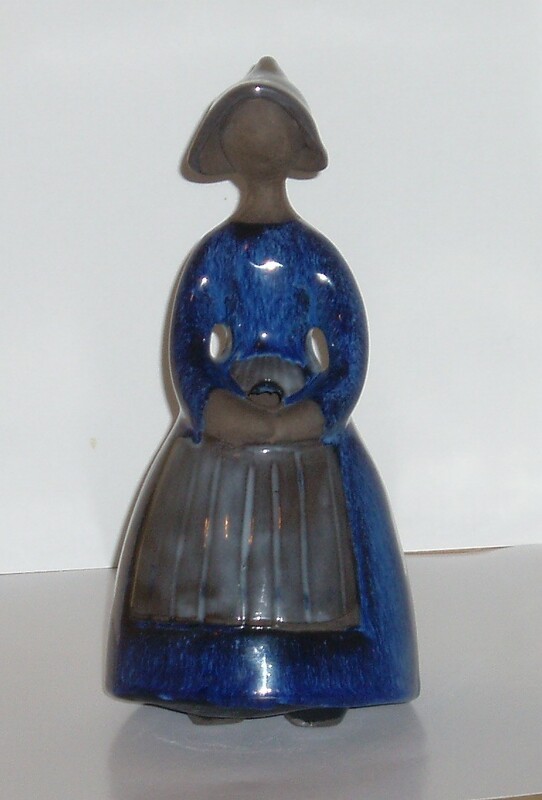 Dimensions: height 19 cm, diameter at the base than 9 cm. 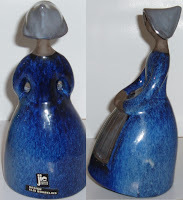 Here is one of the famous statuettes (figurines) made by no less famous Bourelius Elsie (Elsie Margaret Bourelius b. 1919 - d. 2001) for "JIE Gantofta" - where she created valuable art pottery between 1965 to 1973. Elsie B. made serious studies of ceramic art in Stockholm, the "Belle Arte" (1929-1934) and Berlin, throughout 1936. She is considered one of Europe's most important ceramists, with many exhibitors and pieces like owned by the museums devoted to ceramics. I will not describe this piece of art, (you can see the photos), but I will insist that "florist" (Blomsterflickan - or Flower girl) came to be forged, copied, imitated by all means - and that says a lot about aesthetics and why not the authentic material. Coincidentally or not, I have two "florists" - one 100% genuine, the other a copy (not to say false, however, that we not talk of a Picasso!). Quite successful, who managed to fool me, recognize . It is possible, I think, that some "Florist" may have also been made in JIE and after leaving the artist. 1. Clothes - from the authentic is worked separately and then placed on the head, different color and the top is higher. 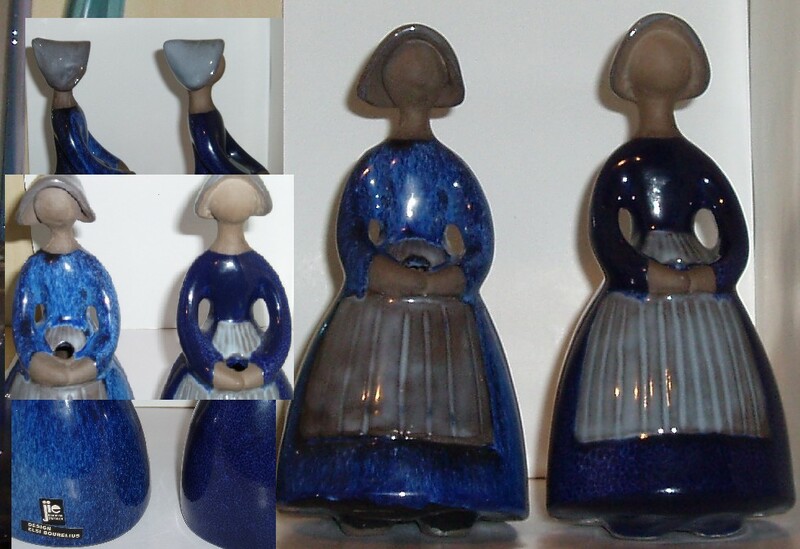 The copy is worked in block, not added - as in "flower girl" smaller than 12 cm high. 2. Going down to the authentic neck is thinner, more delicate. 3. Colored dress, which is the resistance of the drawing, is a dark blue, mottled, suggesting light fall on the dress - the authentic piece. And speaking of color, I met online market all sorts of colors, from burgundy red to yellow, green - or blue when only one was used by Elsie B. 4.The apron - its outline is shaded with a dark blue to black. And would be ... the lack of stickers sites, the color of the tiles, which is more closed to the authentic.